JW Auto Care, local to Scottsdale and Tempe, is honored to have several shop certifications. When you bring your vehicle to our auto repair shop, you’ll feel confident knowing that we are a proud member of the Automotive Service Association (ASA) and the National Institute for Automotive Service Excellence (ASE). Most of our auto mechanics are ASE-Certified Technicians, and two are ASE-Certified Master Technicians. What Does these Shop Certifications Mean to the Consumer? Our business practices are of the highest standards. In fact, we’re A+ rated with the Better Business Bureau. The parts and auto repair services we perform are the best available--and our pricing structure is fair and honest. We are constantly training so that our auto mechanics can stay up-to-date on all the latest developments in the fast-changing world of auto repair technology. Why is ASE-Certified auto Repair Important? In the past, finding a good auto mechanic was mostly a matter of luck. Thanks to the non-profit National Association for Automotive Service Excellence (ASE), it’s much easier to find a competent technician to perform your auto repairs. 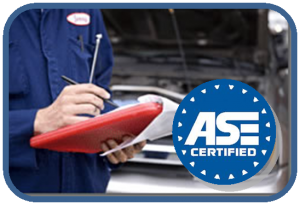 ASE tests its member auto mechanics in all major areas of auto repair and service every five years in order to maintain their certification. There are now around 400,000 currently certified ASE professionals, including those here at JW Auto Care. In fact, we also have two Master Technicians on our staff to serve the auto repair needs of the Scottsdale and Tempe areas. Look for courteous staff, with a service writer willing to answer all of your questions. Look for evidence of qualified technicians: trade school diplomas, certificates of advanced coursework, and certification by ASE. To be listened to and treated with respect by the auto mechanics. ASA members number one priority is earning and keeping their customers’ satisfaction and trust. At JW Auto Care, we’re proud to say that an average 78 percent of our customers are repeat customers. The auto mechanics that perform your auto repair have years of experience. The average ASA auto repair shop has been in business for 24 years, and 94 percent are family-owned, like JW Auto Care. Diagnoses and auto repairs are accurate and fair. ASA members keep up with the ever-changing world of auto repair technology by attending classes regularly. Click here for more information about the ASA. To employ the best-skilled technicians obtainable. To maintain a system for fair settlement of customers' complaints.